The Exploratorium in San Francisco is a wonderful hands-on science and human perception museum located on Piers 15 and 17 along the Embarcadero. This engaging SF attraction offers more than 600 interactive exhibits where you can learn about everything from light and sound to human emotions and perceptions. It includes several entertaining galleries each based on a different topic. The museum is an amazing adventure and perfect for everyone from toddlers to adults. Each gallery includes several levels of interactive exhibits, so it truly is designed for kids of all ages. Why did the Exploratorium move? It originally opened in the Palace of Fine Arts in 1969 and was created by Frank Oppenheimer, a physicist and educator. Over the years, the museum expanded and it eventually needed additional space to continue its growth. It moved to its current home in April 2013. You will want to set aside at least three to four hours to really explore this San Francisco museum. You could run through it faster, but to really experience it all, make sure to leave a full morning or afternoon to see it all. Monday: Closed except on select holidays such as Martin Luther King Jr. Day, President's Day, Memorial Day, Labor Day, the Monday of Thanksgiving, etc. Visit their holiday page for details on staying open certain Monday holidays. FREE: California Public School Teachers, you must apply online to qualify for free admission. Purchase your tickets in advance, online through City Sightseeing. They sometimes offer a small discount on ticket purchases. While the Exploratorium in San Francisco does not have coupons or discounted tickets, you can get a deal on your admission through one of the San Francisco discount cards. These cards include admission to numerous places around town. Here are the three best discount cards that include admission to the Exploratorium in San Francisco. City Pass: The City Pass is one of the most used discount passes in San Francisco. It includes access to the Exploratorium, the California Academy of Sciences, and the Aquarium of the Bay. You will also receive a ticket for a 60-minute bay cruise as well as a multi-day Muni (our public transit) pass. It's a great deal with a savings of more than 40% vs. purchasing all of these individually. Mega Pass: City Sightseeing has also create a Mega Pass that is great for visitors. It includes admission to the Exploratorium in San Francisco and a single or multi-day pass to their fun Hop On Hop Off Bus Tours. You can also choose other attractions to visit from a list of more than 20 including the California Academy of Sciences, the SF Museum of Modern Art, or the Walt Disney Museum. Go Card: The Go Card, by Smart Destinations, is the third pass I recommend checking out for discounted admission to the Exploratorium in San Francisco. This is based on the number of days you have for your visit. You can choose a 1, 2, 3, or 5-day pass. The longer your pass, the more you can see from their list of more than 25 attractions and activities. With this pass, you can save more than 50% vs. what it would cost to purchase these admission tickets separately. 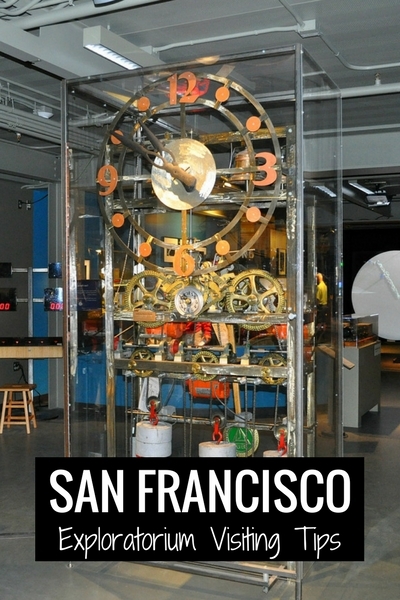 The Exploratorium in San Francisco offers a number of free days throughout the year. They are often on Pi Day, Mother's Day and a few other special days throughout the year. 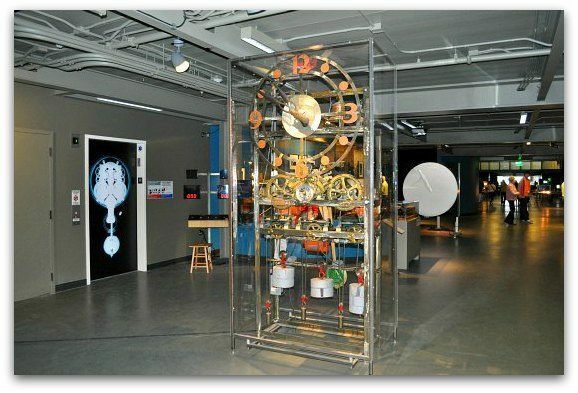 What Are the Best Ages for the Exploratorium in San Francisco? Is the Exploratorium in San Francisco for toddlers? Will kids that are one, two, three, or four years old enjoy their visit? The answer is yes! The Exploratorium in San Francisco is a wonderful place for toddlers. There are several hands-on exhibits just for them. In addition, they will love the light and sound exhibits mixed in with the other exhibits. 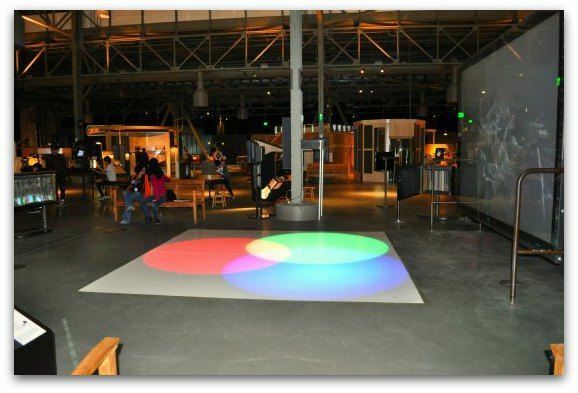 Is the Exploratorium in San Francisco for adults? You bet! It's a playground of fun activities for all levels. If you are an adult that loves to play around and learn, you will really enjoy the experience here. I've been here several times on my own and always discover a new and interesting exhibit or activity. Adults will also love the After Dark Happy Hour on Thursday nights. This is a time when only those 18 and older are allowed to attend. It's a chance to play around at the museum and act like a kid again. These fun adult only night also include cocktails and additional activities based on that evening's theme. It runs from 6pm to 10pm most Thursday nights. The Bay Observatory Gallery is on the upper level of the museum toward the back of the building. Here you can learn more about weather patterns. You can also learn about the interaction of natural and human forces in the landscape. The gallery includes a variety of maps that allow you to research the world in different ways. You can also climb inside their Sky View display to see what the sky in SF currently looks like and how it affects the surrounding city scape. 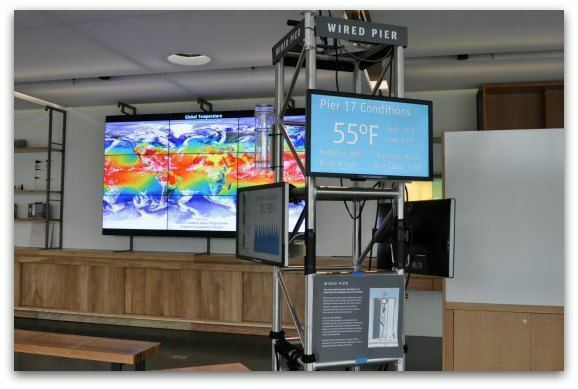 The centerpiece of the room is the large monitor that shows current weather patterns and temperatures around the globe. The fog display and interactive exhibits are also interesting. This is just one of two displays where you can learn more about why SF gets foggy weather throughout the year. The East Gallery sits in the back of the Exploratorium. It houses displays on all living things, both big and small, from a large redwood tree to small plants that curl up when you touch them. Here you will also learn about plant and animal cells. There are several monitors showing live organisms under microscopes. 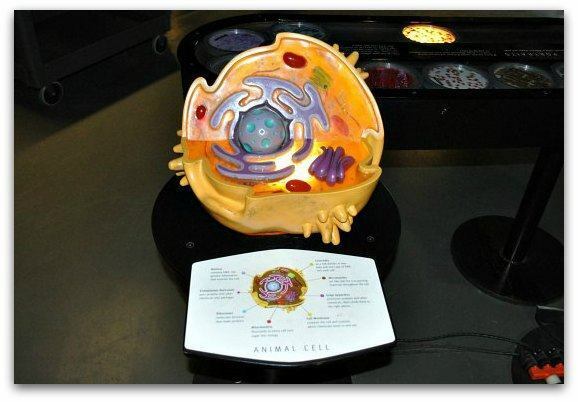 In addition, they have models where you can look inside a cell. This picture shows what the cell of an animal looks like. While you are here, make sure you also stop by the Explainer Station. They have some fun games and can tell you more about some of the exhibits in this area. They also have a schedule of activities throughout the day. The next gallery is the Central Gallery. In this one, you can learn more about light, vision, sound, and hearing. This area teaches about things such as how light impacts color, ways to create different sounds, and how curved mirrors can change how you see things. One of my favorites in this gallery is clear in the back. It measures the amount of sound you produce when you walk on gravel. You can walk through as many times as you like and even compare your scores with others. Another favorite in this area is the shadow box. 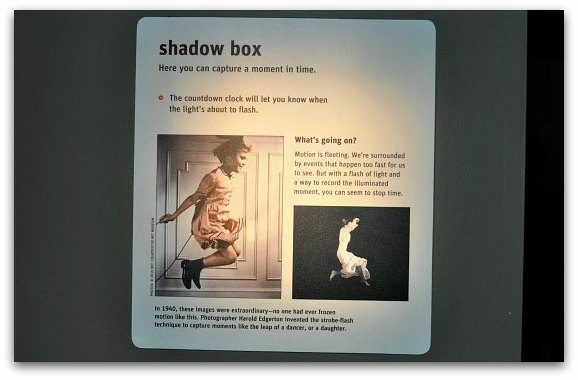 It's a large room that allows you to capture your shadow at a moment in time. You can enter with up to 10 to 15 friends to capture a group moment. The South Gallery is also called "Tinkerville". Here you can tinker with your hands and explore your creativity. Exhibits in this area include large magnets where you can build fun creations, see how electricity is made, and learn about gravity. This display is called the "Strange Attractor". 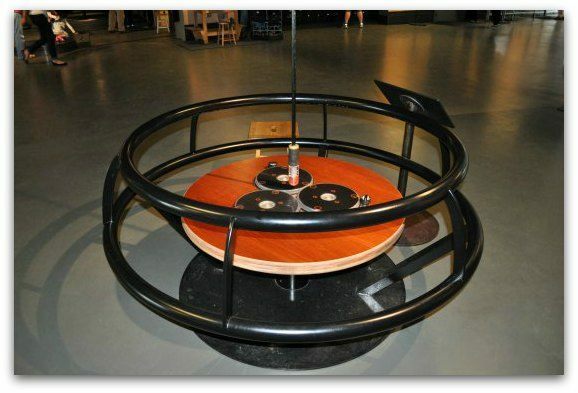 The magnets and discs inside make the pendulum move in unpredictable ways. This one is an open clock. It allows you to pull and move the gears, which in turn shows you how the clock works. The final section in the Exploratorium in San Francisco is the West Gallery. This is where you can learn more about thoughts, feelings, and social behavior. 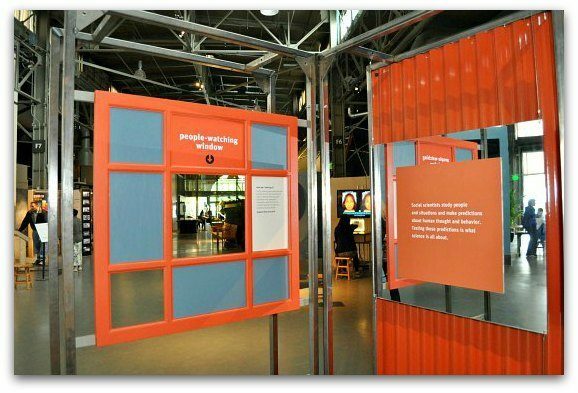 Displays here include facial expression recognition, a unique display on mental illness, and several 'people watching' areas. An interesting one in this area is a small board where you and a partner can evaluate your perception of another person. On this sliding board, you rate your perception of someone based on certain characteristics such as playfulness, how detail-oriented they are, and if they are optimistic or pessimistic. You then compare your board with your partner. I'm sure you will find quite a few differences. This area also includes a group think table. Today's topic was on stereotypes. You are welcome to listen, learn, and participate. The Outdoor Gallery at the Exploratorium in San Francisco includes spaces for those with and without tickets. This is an interesting space, so make sure you don't miss it on your visit. One of my favorites in the paid area is Remote Rains. 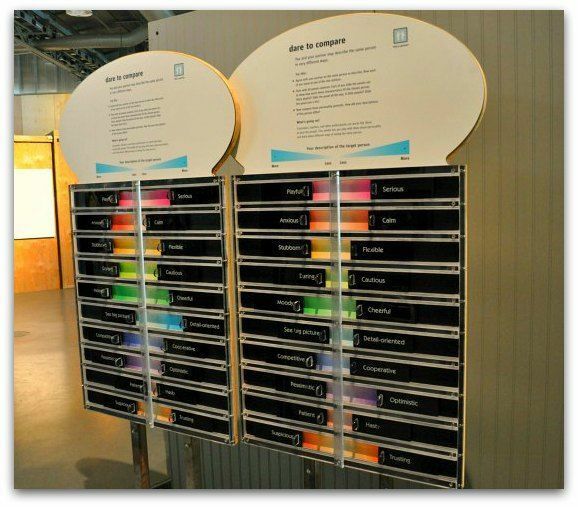 Step up to the kiosk and select a previous rainstorm. 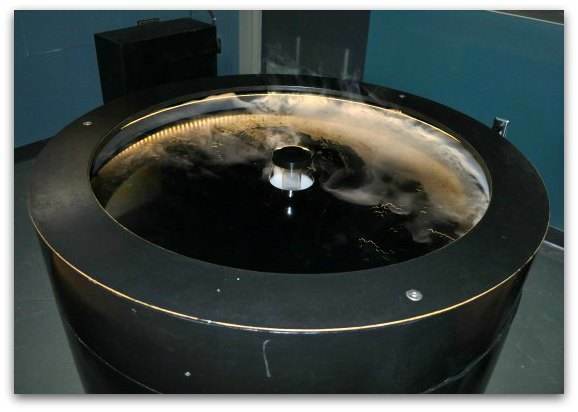 It's rain machine will create a similar storm where you can see the frequency, volume and size of the drops. You will find a rotating collection of free exhibits in between Piers 15 and 17. Each exhibit usually stays for a few months or longer and there is always something new to discover. Another interesting exhibit at the Exploratorium in San Francisco is the Tactile Dome. Inside the dome, it's pure black. You then touch, feel and bump around inside using your sense as clues on what to do next. It's a unique experience and fun for those that really love an adventure. Admission to the Tactile Dome is only for those 7 and older. Reservations are required in advance. You must call (415) 528-4444 (select option 5) or visit them in person to make your appointment. Each session is one-hour long. Admission to the Tactile Dome is $15 or $10 during the After Dark event. Should you visit the Exploratorium or the California Academy of Sciences? What are the differences between these two San Francisco museums? These are two questions I get all the time. My first answer is to visit both, if you have the time. However, since that isn't always possible, let me see if I can help you decide. Both museums offer a hands-on, interactive and engaging learning experience. They are both great for toddlers, kids and adults. With this being stated, they have a very different offering. The Exploratorium's set of exhibits focus more on human perceptions, science and the weather. They teach you about everything from how cells work to how you perceive colors and sounds. You can also learn more about human behaviors as well as storm patterns. The California Academy of Sciences focuses on animals, natural history, the environment, and the solar system. They have a huge 4-story rainforest where you will learn more about the differences between rain forests around the world as you walk through colorful butterflies and past snakes (yes, they are caged!) that live within each one. They have a planetarium with several shows every day. They also have a natural history museum, a large aquarium, a living roof, and an Earthquake exhibit where you can feel what an earthquake is like. Which one you select depends on which type of exhibits interest you more. If you are short on time, I'd pick the Exploratorium in San Francisco for two reasons. It's closer to the heart of the action including many hotels. It will also take a little less time to explore. If I had most of a day to spend at a museum, I'd pick the California Academy of Sciences in Golden Gate Park. It will take a little more time to get there, but the experience is worth it for its live animals, planetarium shows, and the rainforest. 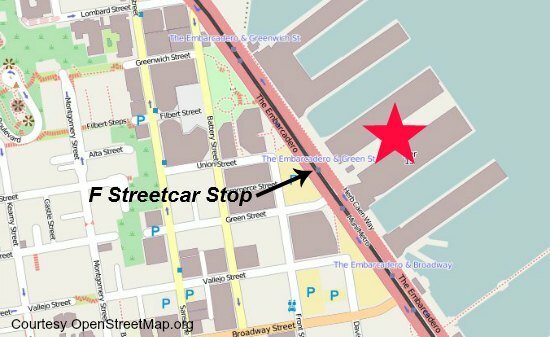 The easiest way to get here from both Fisherman's Wharf and Union Square is by taking the F streetcar. In Fisherman's Wharf, you can pick it up on Beach Street. In Union Square, you can pick it up anywhere along Market Street. You will want to get off the streetcar at the Embarcadero and Green Street stop. This is right in front of the building. Here is a map showing the location. One of the biggest hassles in San Francisco is parking. However, you will be delighted to learn that there are several great parking options nearby the Exploratorium in San Francisco. Here are a few options including some estimated prices for each one (these change around often, so make sure to double check their prices when you arrive). Green & Embarcadero: The closest parking option is right across the street from this SF kids museum. It's located at 1050 Front Street. Pricing is around $5 per hour and up to $20 for the entire day. This is a flat parking lot, so you will need to arrive early to secure your spot. Pier 19: Another parking option near the Exploratorium in San Francisco is at Pier 19. This is next door to the museum and offers public parking for about $20 a day. Embarcadero & Broadway: You will find another flat parking lot at Embarcadero and Broadway. This is just a couple of blocks away and an easy walk to the museum. This one is also about $20 for the entire day. Front Street Near Broadway: You will find several lots and a garage in the area of Front Street near Broadway. This allows you to shop around a bit for a better price. They range in prices (for the day) from $13 to $20. 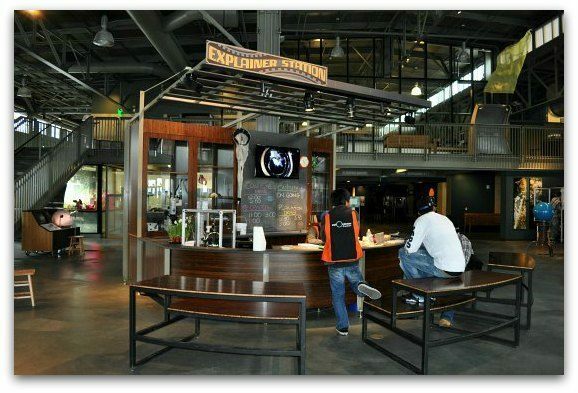 What's nearby the Exploratorium in San Francisco? Located right on the Embarcadero, you will find plenty of fun things to see and do nearby. Ferry Building: The Ferry Building is just a half mile away. You will find it at Pier 1 along the waterfront. More on visiting the Ferry Building. Alcatraz Ferries: The Alcatraz ferries are also just a about a half mile away. You will find them on Pier 33. More about visiting Alcatraz. Pier 39: Only about a mile north, you will find Pier 39 and the start of Fisherman's Wharf. You can walk or take one of the historic street cars. More about Pier 39. Union Square: Union Square is about 1.5 miles from the Exploratorium in San Francisco. You can either walk or take one of our street cars to get there. What there is to see and do in Union Square. 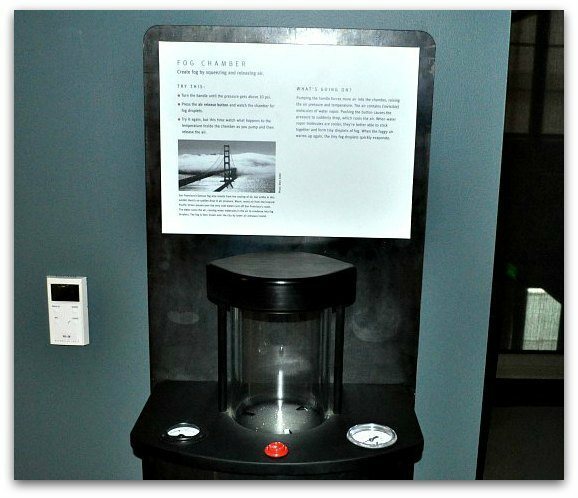 What else do you want to know about your visit to the Exploratorium in San Francisco?